Need to make a last minute gift? 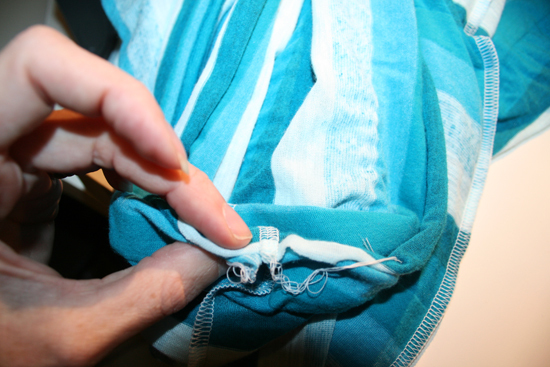 You can make an infinity scarf in less than half an hour! 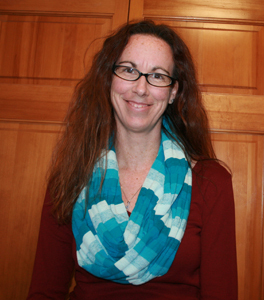 Infinity scarves vary in length and width. Browsing through etsy, most give length measurements between 60″ and 72″, and widths vary from 8″ to 20″. 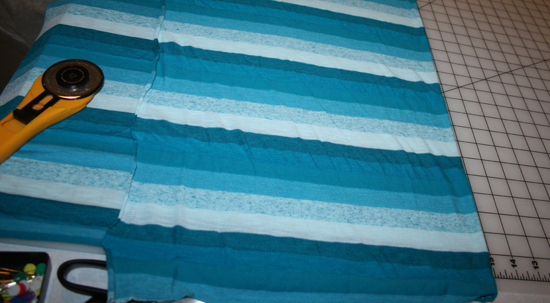 This one is going to have a 72″ loop and be about 15″ wide on each side. 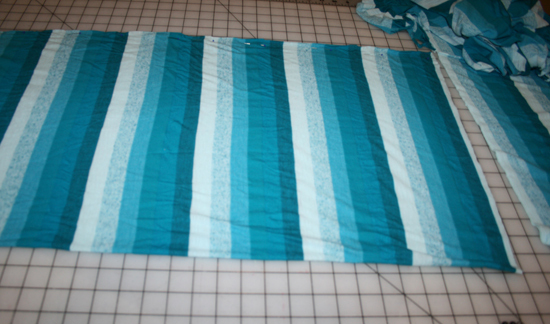 Lay the fabric out, right side up, on your cutting mat. 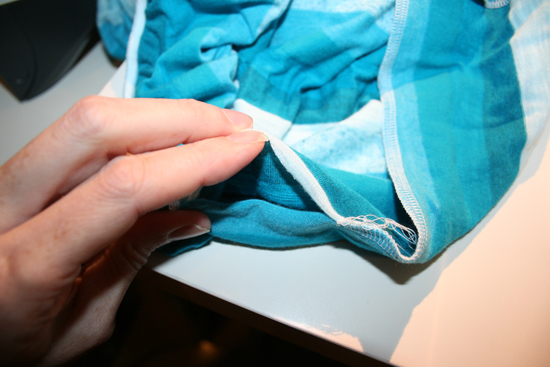 Fold up the long side to the 15″ line. 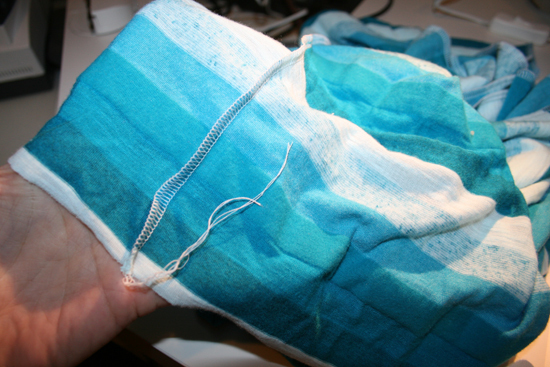 Right sides are together, which is good because we are going to sew this seam in a minute. 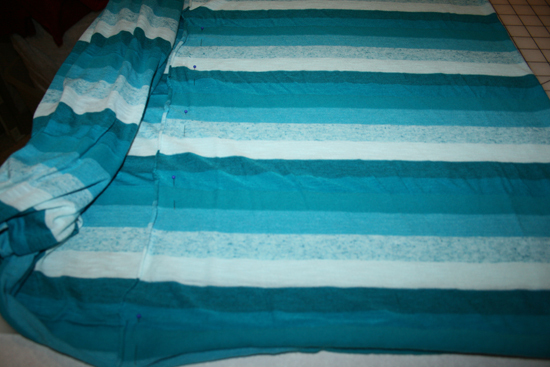 Cut along the edge you’ve just lined up, cutting through both layers so you have two nice layers to sew together. The piece should be about 72″ long and 15″ folded, so if you were to unfold it it would be 30″ wide. Resist the urge to unfold it! Serge (or sew on the sewing machine) the long side. 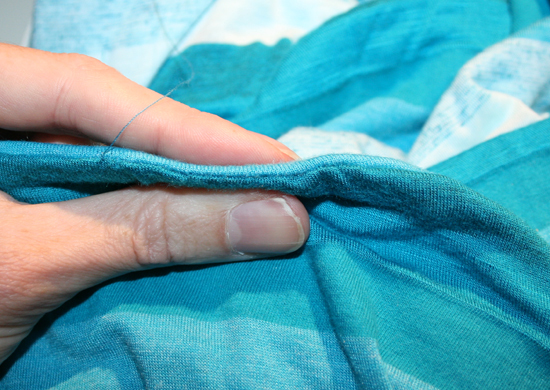 I’m using 75/11 ballpoint needles in my serger for this thin knit. 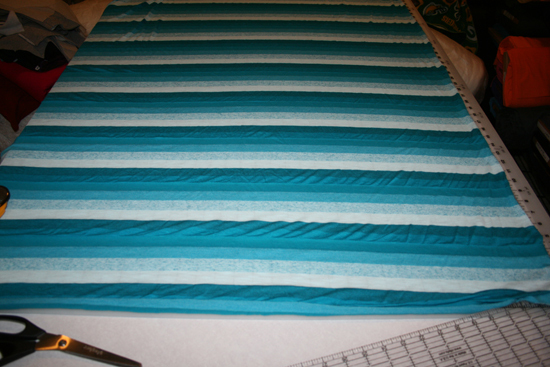 Look, all those pins paid off – the stripes are lined up! This next part is a little confusing. 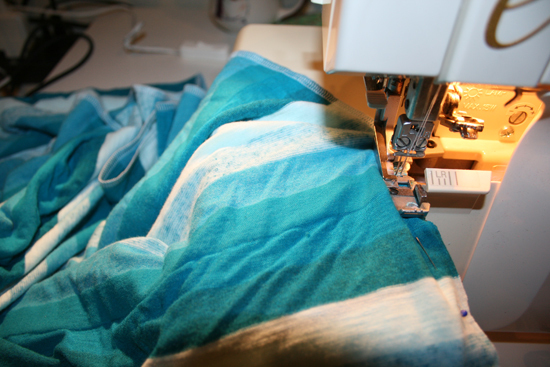 Take one end of the fabric and pull it inside the tube you’ve just created. 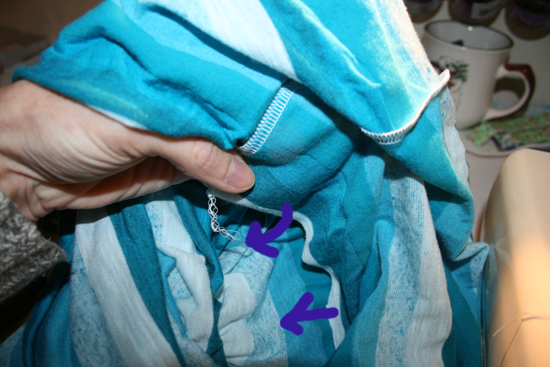 When you do this, the right sides will be together inside the tube. 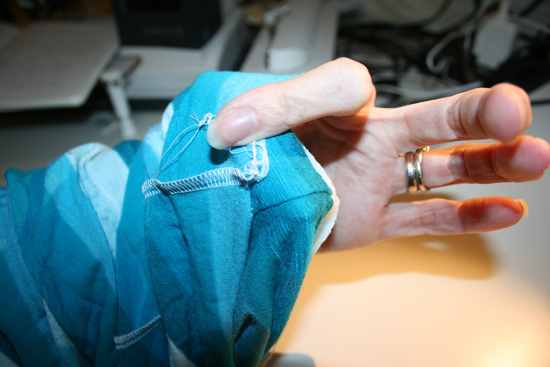 See – my arm is in the tube here and the bottom layer is the one that’s been pulled through. 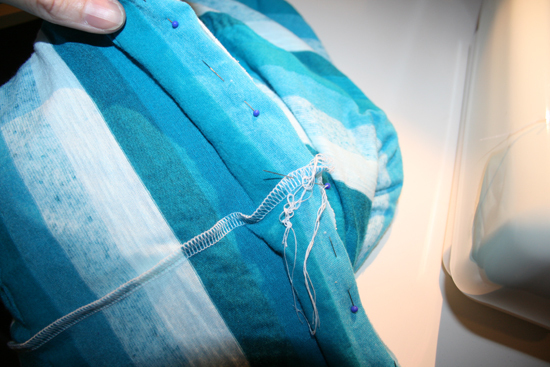 Pin the raw edges together and then sew, leaving an opening for turning it right side out. About two inches is plenty to pull the inside out. Go ahead and turn it right side out. It’s almost finished! 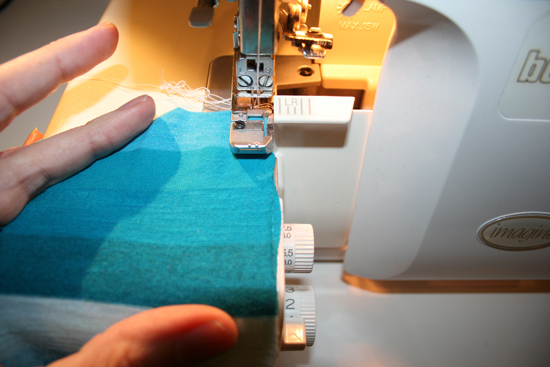 Ladder stitch your opening closed. 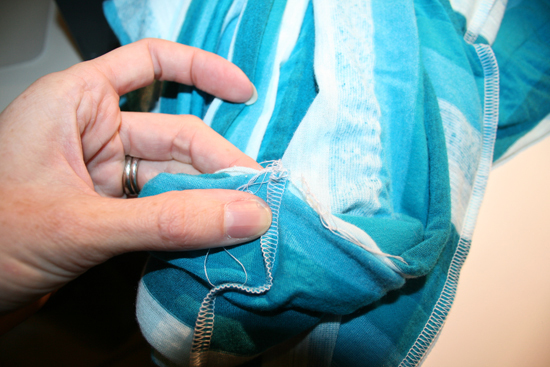 Use small stitches and it’ll hardly be noticeable! Just ignore the crazy hair. At this point in the day, I was just happy my fourth grade photographer managed to get both the scarf and my head in the picture!